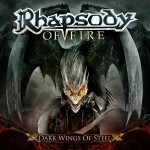 Share the post "Album review: RHAPSODY OF FIRE – Dark Wings Of Steel"
Keyboard wizard Alex Staropoli, founding member of the Symphonic Metal outfit Rhapsody (Rhapsody Of Fire since 2006), is a man who has suffered trials and tribulations and undoubtedly grown a second skin through relentless exposure to the music industry over the past 20 years. Even he, though, must have felt a certain level of unease when his old comrade, guitarist Luca Turilli, decided to jump ship and form his own version of Rhapsody (Luca Turilli’s Rhapsody) in August 2011 – further confusing the band’s original and much loyal fan base. Most of the times things have a way of sorting out themselves and, following yet another line up shuffle, Rhapsody Of Fire are back with a new album entitled “Dark Wings Of Steel”. The fact that 2011’s “From Chaos To Eternity”, Saropoli’s last ‘exercise in high quality musicianship’ alongside Turilli, was a truly impressive album must have made the keyboard player somewhat anxious regarding the task at hand. If that was indeed the case, then the forty three year old virtuoso needs to be congratulated for having turned that negative energy on its head to produce eleven emotionally powerful and technically challenging compositions that can easily compete with any material he has assisted in bringing into life over the years. With crooner Fabio Leone in top form and a second member of the Holzwarth family (bassist Oliver) joining ranks during the latest reshuffling, the band sounds tighter than ever. What about Turilli, though? Is his absence not felt on this album? Well, newly-acquired guitarist Roberto De Micheli has done such a sterling job on the album (an album that sounds much more heavy and ominous than any of its predecessors), that I see his employment more as a positive development rather than an addition made through necessity. The dark mood which characterises the vast majority of the album is clearly audible in the chorus-led opening ditto “Vis Divina”, while “Rising From the Tragic Flames” finds the atmosphere blending in nicely with the band’s more traditional/classic Power Metal elements. Operating at a much slower tempo, “Angel Of Light” is a cleverly orchestrated piece which revolves around a beautiful keyboard tune, while “Tears Of Pain” finds the band treading on Symphony X waters. Being a real sucker for classic heavy riffs and memorable refrains, I was immediately attracted by the Kamelot-inspired “Fly To Crystal Skies”, while also appreciating the eight minute “My Sacrifice”, which finds the duet Staropoli/De Micheli indulging in an interesting but rather elongated solo competition of sorts. “Silver Lake Of Tears” was a tad too generic for my liking but the same cannot be said for “Custode Di Pace” – a beautiful orchestrated ballad that, at times, draws references from Crimson Glory’s magnum opus “Lost Reflections”. The three compositions which conclude this album allow Alex Staropoli to truly flex his musical muscles. Both “A Tale Of Magic” and “Dark Wings Of Steel” would have sounded less impressive with the exclusion of his keyboard/orchestral arrangements, while the closing four and a half minute “Sad Mystic Opus” is nothing other than a testimony to his impressive compositional skills. Rhapsody Of Fire are continuators of a rich and commercially successful musical legacy, the initial steps of which I often found myself struggling to connect with. The same, however cannot be said about its current reincarnation: albums like “Dark Wings Of Steel” present the variety and artistic expression that any top class Symphonic Power Metal album needs to possess in order to obtain my vote. Change is not always a bad thing, especially when it proves beyond any doubt that ‘life after Turilli’ is indeed a feasible concept. Very well done! This entry was posted in ALBUM REVIEWS, ALBUM REVIEWS (Mobile), All Posts, PURE METAL (All posts), Pure Metal/Album reviews and tagged album, Alex Staropoli, Dark Wings Of Steel, power metal, review, RHAPSODY OF FIRE, rock, symphonic. Bookmark the permalink.